Campylobacter is among the most important agents of enteritis in developed countries. We have described the potential environmental determinants of the seasonal pattern of infection with campylobacter in Europe, Canada, Australia and New Zealand. Specifically, we investigated the role of climate variability on laboratory-confirmed cases of campylobacter infection from 15 populations. Regression analysis was used to quantify the associations between timing of seasonal peaks in infection in space and time. 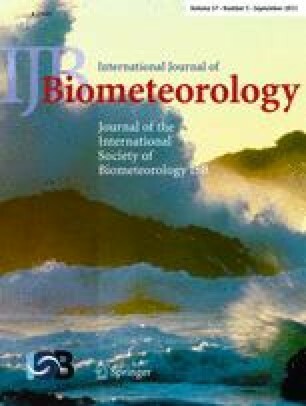 The short-term association between weekly weather and cases was also investigated using Poisson regression adapted for time series data. All countries in our study showed a distinct seasonality in campylobacter transmission, with many, but not all, populations showing a peak in spring. Countries with milder winters have peaks of infection earlier in the year. The timing of the peak of infection is weakly associated with high temperatures 3 months previously. Weekly variation in campylobacter infection in one region of the UK appeared to be little affected by short-term changes in weather patterns. The geographical variation in the timing of the seasonal peak suggests that climate may be a contributing factor to campylobacter transmission. The main driver of seasonality of campylobacter remains elusive and underscores the need to identify the major serotypes and routes of transmission for this disease. S. H., S. E., K. L. E. and S. K. were funded by the European Commission as part of the project Climate Change and Adaptation Strategies for Human Health (cCASHh) (EVK2-2000-00070). The authors would also like to thank: C. Tirado at the WHO Regional Office for Europe for help with obtaining the surveillance data; C. Koppe at DWD, Germany, for supplying meteorological data; M. Fleury at Health Canada for analysis of the Canadian health data; A. Maarouf at Environment Canada for Canadian meteorological data; Communicable Diseases Network Australia, National Notifiable Diseases Surveillance System for providing the data for notifications of campylobacterosis for the years 1991 to 2001 and the Queensland Department of Natural Resources and Mines for providing interpolated temperature data for the same years; At Health Protection Agency, I Gillespie for extracting and cleaning the England and Wales campylobacter surveillance data, and G. K. Adak for advice; C. McGuigan at the Scottish Centre for Infection and Environmental Health for the Scottish surveillance data; M. Baker at Environmental Sciences Research, for advice and provision of New Zealand surveillance data.